If you want to learn about mounting posters, gluing matboards, attaching dust covers to the back of framed artwork this is the web site you have been seeking. We can help you with poster mounting – from the gluing of the poster or print onto matboard, foam-core, or other board stock, to the application of a texture coating on your mounted print, Gluefast has the answers! 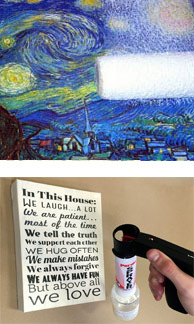 Mounting Posters - We have three items shown below for poster mounting, including a gluing machine to glue the poster, the poster glue, and a mounting press. Gluing Matboard - We have the only precision glue bottle with acid free adhesive for gluing matboard & dust covers. Now you can eliminate double-sided tape with a savings of up to 80%! Water Based Acrylic Canvas/Print Coatings - Coatings are available for application onto canvas giclee & printed stock to protect the finish. We also have texturizing gels and coatings for the same after they have been stretched or mounted, providing the look of a hand painted item. Apply a thin film of adhesive onto the paper or board stock with ease. 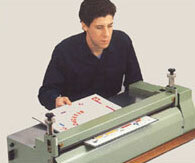 The Colonel label gluer is available in 20" and 32" roller widths. It is typically used for gluing/mounting large paper for poster prints. The Colonel's heavy-duty double roller system means precise glue film control. Gluefast offers the best Lay Flat Glues and adhesives for mounting, including acid-free water-based products. Lay Flat Glues are available in gallons, 5 gallon pails and 55 gallon drums. The Adjutant Press is used to smooth out the combined glued print/board combination to insure that there are no air bubbles or wrinkles up to 1/8" thick. It is available in 20", 32", and 42" roller widths. After placing the label through the Colonel gluer, the glued label is then placed on flat board stock. The combined label/board is fed through the Adjutant Press which features an upper rubber roller and a lower metal roller. The label/board is then placed in a stack to dry. New! 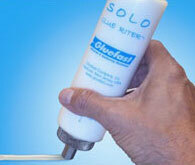 SOLO GLUE RITER™, a simple squeeze bottle applicator with the precision of a sophisticated dispenser. 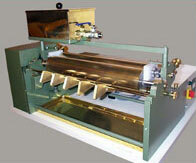 The GLUE RITER™ is also available attached to one of our pressure tanks for higher volume use. Press down on the item and adhesive flows! Remove SOLO from the item and the flow stops! Portable, versatile, and efficient. The new SOLO GLUE RITER™ features a pen-like applicator attached to a simple squeeze bottle. Adhesive flows in 1/2" line widths. Designed for matboard gluing, dust cover gluing and many other uses! Replaces double sided tape with a 90% savings! No daily cleanup! When the SOLO GLUE RITER™ is not used the adhesive film dries but can be easily removed by peeling it away from the nozzle. Buy SOLO GLUE RITER™ and MATHESIVE on-line now. MATHESIVE 101 can be purchased in quarts, gallons, 5-gallon pails and 55 gallon drums. It is water based and is pH neutral (acid free). For more information request the Gluefast Service Bulletin for MATHESIVE 101 or MATHESIVE 202. 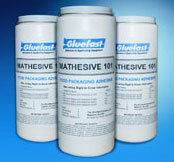 Gluefast’s MATHESIVE 101 is fast setting and allows you to reposition the material for a few seconds. The SOLO GLUE RITER™ includes this adhesive with the bottle! Great for gluing matboard, dust covers, and wood to wood. MATHESIVE 202 glues everything our 101 formula glues plus it is also good for gluing dust covers to ABS (plastic) frames. a. Pre-Mount / Pre-Stretch “CV” Coatings - These coatings are applied onto canvas or paper prints to provide enhancement and protection. With canvas giclees the coating also provides elasticity so that when a canvas is stretched onto a wooden frame the ink does not tear. These coatings are available with or without added uv protection in a hi-gloss or matte finish. Formulas available for application with a Mayer rod or paint roller. For information on our new CV Spray Kit, click here. b. Post-Mount / Post Stretch Texture Coatings/Gels - Our Craquelure brand coatings offer excellent texturizing and protection, eliminating the need for glass! Applied with a simple paint roller, putty knife, or paint brush, these coatings are available in matte, semi-gloss & hi-gloss coatings. Additional uv protection may be provided although minimum orders apply. For a brochure on our Print Coatings click here. The new Senator Top Coater applies the CR coating (or water based dextrin or resin adhesive) onto nearly any item from paper to board stock up to 1/2" (13mm) thick! The convenient tank over the rollers uses an easy to open valve to dispense CR onto the roller assembly. Coating thickness is achieved by adjusting two knobs. A pressure bar attachment helps propel the item through the Senator, assuring an even film of CR coating onto paper materials or items up to 5/8" thick.